The late nineteenth and early twentieth century have been called the golden age of American advertising. 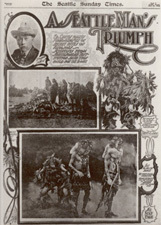 With the rise in publication and readership of popular magazines, the American public became accustomed to the aesthetics and language of the advertisement. There were a set of visual and verbal cues that signalled the class, gender, race and ethnicity of the intended audience. 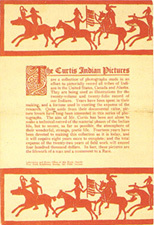 Below are three advertisement's for Curtis's The North American Indian (click on the images to view at a higher resolution). The advertisement on the left probably would have been sent out to potential subscribers, because of the quality of the print and the tone of the writing. It stresses the time, effort, and money spent "not alone to make a technical record of the material phases of the Indian life, but to secure, as far as possible, the atmosphere of their wonderful, strange, poetic life." It goes on to call the volumes, "the lifework of a man and a monument to a Race." However, the advertisement in the center from the Seattle Sunday Times was obviously meant for a popular audience. In addition to two Curtis photos, there is a stereotypical drawing on a Native American, and the sensational claim, "Ed Curtis makes photographs of secret rites of Navajoes--Scientists from Smithsonian Institution said this could not be done." 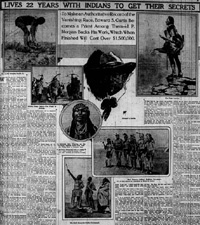 The advertisement on the right, from The New York Times, was also intended for a popular audience, but includes only Curtis's photographs without any additional drawings or graphics, and, although the headline "Lives 22 Years with Indians to Get Their Secrets" is written in the same sensational tone as the Seattle Sunday Times advertisement, the article itself has a more fact-based, less sensational tone.